I sometimes get requests for help. Often they are smart questions and I’m actually somewhat relevant to them – for example questions about a script or an article that I wrote, or an experience I had. But sometimes it is not the case. This message I received today is particularly bad, so I thought it might be a public service to share it as an example of what not to do. This one is especially appalling because it comes not from some wet-behind-the-ears teenager to whom I would gracefully have issued a few hints and a gentle reminder of online manners, but from the inside of the corporate network of Wipro – a company that has a reputation as a global IT services organization. Could you please help me in finding out the solution for my problem. Iam new to perl i have tried all the options whatever i learned but couldn’t solve. Please revert me if you know the solution. Below is the XML in which you could see the lines with AssemblyVersion and Version in each record i need to modify these values depending on some values which i get from perforce. Assuming hardcode values as of now need to change those values upon user wish using Perl. Upon changing these lines it should effect in existing file . From what I gather from the convoluted use of approximative English, the problem is about changing the value of two XML elements in a file. Can anyone believe that this guy has even tried to solve this simple problem on his own ? It is even sadder that he tries to obtain answers by spamming random strangers by mail, soliciting answers that will never be shared with the wider world. Least he could have done is posting his message on a Perl forum so that others with similar questions can benefit from the eventual answer. Had he performed even a cursory Google search, he would have found that one of his compatriots has done exactly that and gotten three different answers to a similar question, letting him choose between XML::Twig, XML::Rules and XML::Simple. These are just three – but the Perl XML FAQ enumerates at least a dozen CPAN modules for manipulating XML data. The documentation for any of them or the examples in the FAQ would also have put him on the track to a solution. Everyone can be clueless about something and learning is a fundamental activity for our whole lives. But everyone can do some research, read the FAQ, ask smart questions and make sure that the whole community benefits from their learning process, especially as it doe not cost any additional effort. Knowledge capitalization within a community of practice is such an easy process with benefits for everyone involved that I don’t understand why it is not a universally drilled reflex. The funny part is that while I’m ranting about it and wielding the cluebat over the head of some random interloper, I realize that the same sort of behavior is standard internally in a very large company I know very well, because a repository of community knowledge has not even been made available for those willing to share. Is there any online community without a wiki and a forum ? Ten years ago I was beginning to believe that consulting opportunities in knowledge management were drying up because knowledge management skills had entered the mainstream and percolated everywhere. I could not be more wrong : ten years of awesome technological progress have proved beyond reasonable doubt that technology and tools are a peripheral issue : knowledge management is about the people and their attitudes; it is about cooperation. This was the introduction of my graduation paper ten years ago, with the prisoner’s dilemma illustrating cooperation issues – and it is today still as valid as ever. Chat is supposed to be realtime conversation – and it often is. But just as some corporate victims live in Outlook (that abortion that Microsoft shoves down user’s throat as an excuse for a mail client) some fellow geeks live with an IRC screen at hand. Those people use IRC for realtime conversation, but not only. Soliloquy is widespread, and having a client with at least half a dozen tabs that are as many parallel conversations is a common occurence. 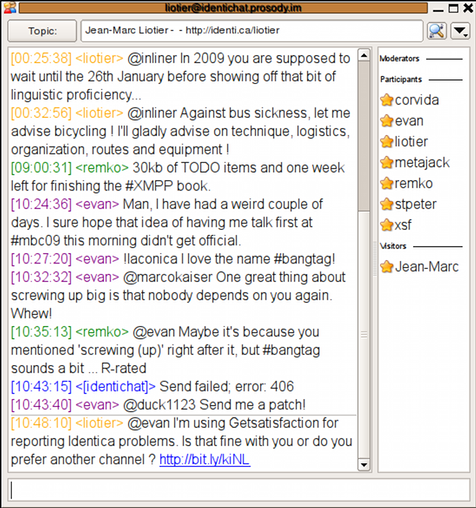 IRC users were microblogging before the term was coined and web interfaces imagined. People come to IRC channels such as project channels to meet the whole group. But just as often they come there to hang out with acquaintances, which they find spread accross various channels. Wouldn’t it be great if each user could have his own channel with just his friends ? This is what microblogging is : a people aggregator, just as any feed aggregator but for the people you want to follow. I have had a hard time so far trying to convince my IRC addicted friends that we should use a Jabber MUC chat room in lieu of our usual IRC channel. Jabber MUC is superior to IRC in every way possible, but as much as we like to rail against the common user’s inertia to technological adoption, we are sometimes no better. Neat isn’t it ? Jack Moffit mentioned it evasively in his article about filtering the realtime web and it piqued my curiosity. From a user’s point of view, Identichat is about joining the Jabber multi-user chat at your_identica_user_name@identichat.prosody.im and you’ll immediately find yourself in a standard MUC room where the participants are your Identi.ca subscribers. The conversation is the microblogging stream that you would normally get at Identi.ca. If you try to enter a notice, a help message in the chat window points out that ‘You can register using your identica account by sending !register username password’. Do that – not ‘/register’ as I mistakenly typed out of IRC habit – and you are set to use Identi.ca as any chat tool. How is that different from a graphical Laconica client ? It is not a Laconica client, it is plain XMPP MUC that about every decent XMPP client supports. As you may know, there are Jabber clients for about every platform you can imagine including mobiles – even some like Mcabber which provide a user interface which will make the console IRC user feel at home. Identichat is not just another client, it is a gateway to a whole world of existing XMPP clients so that every user can use his favorite. Identichat will help Laconica by eroding chat user’s resistance to change. And it could also foster new uses of microblogging as a thick client enables considerably accelerated interaction compared to a web interface. For now it could be faster – the turnaround latency is perceptible compared to IRC or XMPP MUC, and a helpful “line too long” message would be better than “Send failed : error 406”. But I’m nitpicking : Identichat is a wonderful tool that gives new faces to the microblogging infrastructure. An infrastructure that can show different faces to different classes of users has a great future ! It’s hard to maintain the illusion that you’re particularly special, talented and original when, with a quick Google of whatever genius idea you’ve come up with, you see that 3 billion people have already thought that, done that, analyzed that, criticized that, indexed the history of that in Wikipedia and made a fortune on that… In 1995. So now, to really live up to our parents’ and teachers’ praise, we have to work a lot harder, be a lot smarter and know that we’re competing with all of those other 3 billion people who think like us and have already started to act on the kind of ideas and “talent” we have. Actually it was always like that, but slower and invisible. Original ideas are few because similar inputs through similar individuals generate similar outputs – the same problems with the same environment and the same tools handled by people who share backgrounds produce the same conclusions. So it is not surprising that concepts are invented simultaneously and reinvented all the time. I don’t feel belittled by finding out that I’m not unique – on the contrary : I feel empowered by finding that I’m not isolated anymore. I remember lounging in libraries in my youth, reading esoteric technical books chosen at random. I often resented not being able to share that with people who have similar interests. Now we can find each other easily and all be surfing together at the wavefront. Childhood dreams came true – life is good ! But if you anguish about being a unique snowflake just like all the other unique snowflakes, there is still hope for you. Our mental agility and cultural maleability suffer from a rather heavy inertia, so the processing stage is not readily manipulable. That leaves only the input to be tinkered with in the short term – and you can play with inputs a lot ! This is why it is important to cultivate diversity in your social network, and it is also why adding some noise into your web feeds is good for you. Who is not addicted to new stimuli ? The latest issue of the excellent The Big Picture at the Boston Globe, is about the Israeli assault on Hamas in the Gaza strip. While I was looking at the pictures, it dawned on me that the Israeli have a severe media problem. We only see the mighty war machine, the pyrotechnics and the unlucky hapless civilians caught in the middle. This is Hamas propaganda material served on a platter. Why are the Israeli letting the images sway public opinion against them ? “Dating from the siege of Beirut in 1982, Israel has practiced a complex and limited form of urban warfare. In Beirut, this involved a cordon around the city, accompanied by limited attacks with artillery, ground, and air forces to put pressure on the Palestinian Liberation Organization (PLO) and Syrian forces inside. The IDF did not launch a general assault on the city; it awaited a political solution that resulted in evacuation of enemy forces under the auspices of outside powers. Despite the IDF’s restraint, it was depicted as little short of barbaric by much of the international media. The PLO’s evacuation was treated as a victory parade, rather than the retreat it was, and the PLO lived to fight another day. The battle was a tactical victory for Israel, but a strategic defeat. The Beirut experience and ongoing domestic and international pressures color Israeli doctrine. Throughout the current struggle, the IDF generally has not occupied Palestinian cities, a notable exception being seizure of the Jenin refugee camp. The Jenin operation is the exception that proves the rule: the IDF was castigated for its assault on Jenin and falsely accused of perpetrating a massacre”. Palestinian civilian deaths cost Israel a lot of international support – it is in Israel’s best interests to avoid them. With the hypothesis that Israel is a more or less rational player, we can posit that they are taking precautions against them – and that is what has been historically shown. But whatever the precautions, striking targets embedded within urban zones and with no no prior evacuation of civilians causes significant collateral damage, especially if the presence of civilian near targets is not entirely incidental. So the Palestinian civilian death toll should not come as a surprise to anyone. Israel had enough experience to know that it was going to have a major media crisis on its hands. So why has Israel let adverse news leak so easily ? They are obviously trying to control the media by banning journalists from Gaza, but this action actually has an adverse effect : the result is that Palestinian voices are dominating the media. “In 1995 the Russian government lost the propaganda war by default. This time it made every effort to control the media and ensure that its view of the war dominated public opinion. Russia won this information war from day one of the fighting and is still winning. The government and military control access to combatants and censor reporting that could undermine support for the war. Reports of Russian military successes have fueled support for military activities among the populace. However, some military spokesmen have altered the facts and limited independent reporting so much that it is difficult to separate fact from fiction. With few exceptions, Russian journalists have not complained about the media management, and instead have picked up much of the military’s jargon, such as references to “working” in the city instead of bombing or assaulting. Media control was formalized in December 1999 through the mechanism of Resolution Number 1538. The President of the Russian Federation created the Russian Information Center whose job it was to filter information before providing it to the mass media and to control the dissemination of foreign information. Such tight media control was absent in the first fight for Grozny, and it cost the Russians dearly. One analyst noted that after the first Chechen war, the Russian military came to the conclusion that they had to first play out the information war against the Chechen resistance, as in their opinion the Chechens had succeeded in morally disarming public opinion in Russia”. In Gaza, this battle is being won by Hamas and Israel does not seem to be performing information warfare any better than Russia in 1995. Considering how sophisticated the Israeli intelligence apparatus is reputed to be, one can only wonder at such poor performance. Hamas on the other hand can happily stand back and watch Israel do all the work for them. Recently, the United States did a much better media control job at Fallujah. Media coverage was quite tame and few images leaked outside of the United States military approval. It may be because the United States took care of cordonning off Fallujah and emptying it of its population as much as possible before assaulting. At the time, Rory McCarthy estimated that “many of Falluja’s 200,000 to 300,000 residents fled the city before the assault, between 30,000 and 50,000 are believed to have remained during the fighting“. Israeli precipitation precluded such evacuation in Gaza, and it is dubious that they could have afforded that luxury either given the lack of destination for potential evacuees. But they could have emulated some practices such as embedding journalists. The newly published “Tactique Générale” manual (FT-02) of the French Armée de Terre mentions that in every Marine company in Fallujah there were four or five embedded journalists. With empathy toward the troops they are following, the embedded journalists can provide a semblance of counterweight to the insurgent’s natural propaganda support. Hamas ruthlessly censors how Gaza is painted in the media – journalists don’t seem to mind too much and the public does not seem to even notice. Maybe Israel could have done a better job of suppressing information channels, but it cannot operate the same way as Hamas : letting reporters roam with relative freedom is one of the costs of operating as a democracy. The problem is that the free flow of information is antinomic to media warfare. States such as Israel are left with a difficult dilemma : protecting a free society with authoritarian methods is the path toward corruption, and the United States have sufficiently illustrated that fact. But after all, maybe the target audience of Israel’s actions is in Gaza, not in the rest of the world.